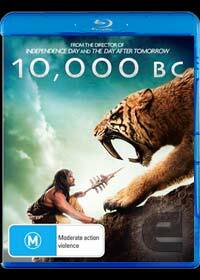 From the director Ronald Emmerich (Independence Day and The Day After Tomorrow) comes 10,000 BC, an epic adventure movie that revolves around a young hunter named D'Leh who falls in love with a young woman with blue eyes which it is claimed has a significant role in the future destiny of the tribe. Unfortunately for this tribe and as per destiny, a group of marauders invade their tribe and kidnap the girl, plus the other male members of the tribe, leaving the tribe decimated. In order to find her, D’Leh leads a small group of hunters to track the marauders. Along the way, they meet up with other tribes who have also been attacked by the marauders and they all join up to attack when they finally locate them in a far away mysterious civilization where the missing tribe members have been enslaved building monuments to a mysterious god. My biggest problem with the film is that you are never able to suspend disbelief in watching the film that is quite unbelievable and embarrassing at times. Coming from a historical background, there are so many historical errors from dinosaurs to the Egyptian civilization being older than it really is. Even the acting is quite clichéd and sometimes truly embarrassing to watch, however where the movie does shine is through the special effects which are quite impressive but fail to save this already doomed movie. The video quality of 10,000 BC is exceptional that is presented in an aspect ratio of 2:40:1 with sharp and clear detail. Black levels are deep and stable presenting an image with excellent depth. Color rendition is excellent as well, presenting a very natural looking image. As with the video, the audio is quite impressive and does support Dolby Digital TrueHD 5.1 which is very clear, especially in certain parts of the movie that truly shine. It's a shame that the story didn't compliment the outstanding audio and video quality. In conclusion, this is one action movie where you need to throw your disbelief away, however for the younger viewers, they will probably enjoy the film from start to finish which then brings up the concern of the rating. It's a shame though, because this was one movie I had high expectations from.